Impact: Tragedy on Irish Roads tells the human stories behind the shocking statistics of deaths and injuries on Irish roads. 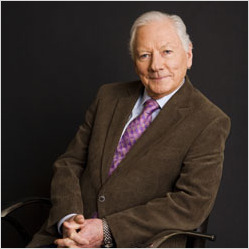 This eye opening two-part documentary series, presented by Gay Byrne, is based on a book of the same name, by TV3’s Western Correspondent Jenny McCudden. This is a different kind of road safety message. It will shock, but because of the sensitive tone, viewers will not have to look away or tune out. In fact, they will be drawn to this programme, for the simple reason that they will care about the people in it. Impact takes statistics and turns them into real life stories. This is not a snapshot of lost lives, but rather a fitting tribute to the victims of road crashes and their families. These people have opened their hearts and exposed the rawness of their grief to help make this programme. Their resilience is commendable; their courage can only be admired. So many families are living the nightmare, they’ve heard the knock in the middle of the night, seen the tell-tale yellow jackets on the other side of the window pane, screamed out to nothing but silence. For the people who love them, a person can never be a mere statistic, a faceless name, a number. Impact: Tragedy on Irish Roads reminds us of this precious fact. It also highlights our vulnerability as road users, another truth that is so often overlooked. No one ever thinks it is going to happen to them – until it does. Hundreds of people die on Irish roads every year, thousands more are injured. Lives are totally destroyed. The reality of living with a brain or spinal injury is laid bare within these pages. A young executive from a top mobile phone company learns how to switch on a computer by himself, his feat for the day. The same man once travelled the globe as part of his job. A solicitor who crashed on the way to her wedding dress fitting will now never walk up the aisle. A mother, who has just made dinner for her two teenage sons wonders why they are late home. Later that night, she is kissing them goodbye in a hospital morgue. Their bodies are still warm. She curses at the sacred heart on the wall as her own heart breaks into pieces. There are so many tragic circumstances to consider when it comes to the aftermath of road crashes. Impact offers an understanding of what it means when lives are shattered within seconds, because behind the wheel, every second counts. Interviewees include former Minister Dr. Jim McDaid and Micilín Feeney, who was left brain-damaged after a drink-driving accident. Those working on the front line in emergency services – gardaí, fire officers, medical personnel – are given a voice, while road safety experts discuss the facts behind our collision culture, why accidents occur and what more can be done to prevent them. Speeding, drink-driving and other legal concerns are examined in detail, with emphasis on the human cost of driver error.